Jim Culley is enrolled in The Master of Arts in Liberal Studies program at the University of Delaware. The present paper was written as part of a course requirement on writing memoirs taught by Professor David Teague. From 1973 to 1984 Jim was a tenured Associate Professor and Associate Dean of the College of Business and Economics, University of Delaware. Before he retired in 2017, Jim was Senior Director of Corporate Communications of Hologic, Inc., a global healthcare and diagnostics company. He joined Hologic in 1997 when Hologic purchased Direct Radiography Corp., an E.I. DuPont de Nemours & Co. Medical Products spin off. Mom and her mother, Franziska Voll Buehner. Mom on her 80th birthday. Mom and Dad (behind camera) on one of the first Cinecraft films. As we had done dozens of times before, my wife, Mary, and I traveled home to Cleveland to celebrate Mom’s birthday. 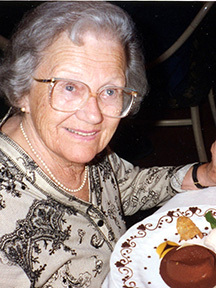 When Mom turned 100, we celebrated at Houlihan’s, our “go to” restaurant that we always used for family events. Unsaid but felt was the feeling that this might be the last time we would be able to celebrate Mom’s life and have Mom participate on the same playing field as the rest of us. When you hit the 100-year mark, it’s easy to get recognition. All it takes is a few phone calls or a letter. Mary wrote every one. Pope Francis sent his blessing. President Obama wrote Mom a note, and the Mayor of Bay Village stopped by the assisted living facility to deliver a proclamation. We sent birthday invitations to all the folks in Mom’s well-worn address book. We didn’t know we had invited her hairdresser until she mentioned that’s how she knew Mom. The fact that her hairdresser from years and years ago would take the time to come out on a Saturday, to be in a room full of people who she didn’t know, shows the kind of impact Mom had on folks. I started the party with a toast then brought the mic from table to table asking each person to tell something about their relationship with Mom. There were lots of smiles and laughs as we went around the room. My brother, Ray, talked about the many warm sunny days he spent on Mom’s deck drinking Manhattans, nibbling on cheese and crackers, and watching the ducks on the pond. A Norwalk cousin said his favorite memories were the Christmas studio parties in the house Mom and Dad had built on the shore of Lake Erie. Neighbors and friends commented on Mom’s smile, her kindness, her laughter. Family members told how Mom could take a tired and true and much-loved dish and make it her own and better—Mom’s “baked” fried chicken, Mom’s spaghetti with meat sauce and beans, or Jell-O fruit cocktail—a household staple when we were growing up. This year the birthday celebration would be quieter. Mom was turning 102. It was clear that the temporary assisted living facility would be her last home—she needed the kind of care that such a place can give. After Dad died in 1983, Mom and I traveled together every time we could, and she came to visit us in Delaware frequently. She particularly loved my trips to Las Vegas and New Orleans, and I enjoyed spending my nights with her seeing the sights and eating in good restaurants. When Mom turned 100, Mary and I flew to Cleveland every month or two. We’d arrive on a Saturday and fly home on Sunday. If we showed up before 11 a.m. or after 7 p.m., we knew Mom would be peacefully asleep with one of her stuffed toys in hand snuggled under her blanket, and the light on the nightstand casting a soft glow. Mary is a letter writer. She sent her Mom and mine and our three children a note almost every week all our married life. On our last visit, several weeks’ worth of Mom’s mail sat unopened on the desk. It was too hard for Mom to get her hands to open envelopes. The leather-covered writing desk that followed Mom from move to move now fit perfectly in the small room that was Mom’s world. She ate many of her meals off that desk. She sat at the desk when she was alone. We’d start our visits opening and reading and talking about the mail that had accumulated since our last visit. I left Ohio when I left for college. My brother, Ray, and his wife, Martha, looked after Mom in the beginning, but when Ray’s work took him from Cleveland to Toledo, my brother, John, and his wife, Carol, took on the job and loved and took care of Mom until her death in 2016. When it became clear that the assisted living facility would be Mom’s last home, we decorated the room with portraits of Mom’s three boys that Mom and Dad had commissioned on one of our winter family trips to Ft. Lauderdale. The pictures had hung conspicuously in all of Mom’s homes, and now they filled a prominent wall in the assisted living facility. After several visits of looking at the pictures of Mom’s boys, I thought it might work better if I hung pictures of Mom instead. The Mom I knew was the Mom I wanted her nurses and visitors to know. The 102-year-old in a wheelchair, crunched over, barely able to speak, was not how Mom would want to be remembered. The next time we visited, I brought blown-up pictures of Mom as a child, Mom in high school, and Mom as an adult and hung them on top of my brothers’ and my framed paintings—they filled the space wonderfully. When we visited, I always brought family pictures. Sometimes I brought new pictures of our children and grandchildren. Sometimes I brought one of Dad’s family photo album. Dad left close to 100 matched, carefully labeled leather covered books going back to the late 1800s. As I turned the pages of the albums, I’d say something and Mom would smile. As the months went by it became harder and harder for Mom to say more than a word or two. On Mom’s 102nd birthday we met in the living room of the assisted living facility. While the others talked, I sat to the side and showed Mom pictures from Dad’s albums. The album I choose included a large color brochure with the title “Bavarian Passion Play.” The brochure included pictures of Albin and Franziska—Mom’s parents, who we had never met. Albin and Franziska emigrated from Germany after WWI. Albin came first; Mom, an only child, and her mother followed a year later. In 1924, Albin and Franziska joined a group of Bavarian players with other Germans from the Cleveland area. Each member invested the little that they had in the hopes of getting a significant return by putting on a traveling Bavarian Passion Play—in German no less. Everyone worked hard on the play. The women sewed costumes, and the men built scenery. The promoter wrote the dialogue, arranged for the venue, and managed all PR, including publishing the brochure. The play opened in the Cleveland Public Auditorium to an almost empty house. After a weekend of poor attendance but good reviews, the players moved to a theater in Detroit and then on to Cincinnati. In all three cities, the results were the same. Mom’s parents lost the money they had invested, and their hopes of a comfortable life in America were less assured. It would be a struggle to prosper in America. Just as it was a struggle in Germany. Mom attended the plays with her parents. I’m sure she saw the hardship brought on her family by the failure of the play. I’m telling you the story about the Passion Play brochure because it was the sign to me to write about Mom and Dad and their remarkable lives now, while I had time to put it on paper. If I didn’t do it, who would? Dad made telling his family story easy. Dad had a tiny notebook in his pocket, or a drawer nearby, his entire life. You never knew when you might need an account number, a name, an important detail. Mostly Dad printed in pencil. If the information were important, Dad would write over the pencil in ink. Most years, Dad needed just one notebook for only the most important details were kept. When Dad no longer wore a suit coat every day, the information was transferred to a card carefully folded in his wallet along with his driver’s license, and enough money to always be able to pay his way in cash. Mom’s life was more difficult to document. She rarely talked about her mother or father or her uncle and his family although they lived just across town. Over my entire life, I never met a relative, never saw a letter from a relative, never heard a call from anyone on Mom’s side of the family. It was the way it was. Something happened but what? It would take until now when both Mom and Dad are gone, to dig into this and other family mysteries. Mom was born on May 16, 1914. World War I began two months later. Mom survived the Spanish flu epidemic of 1918–1919. The influenza pandemic was unusually deadly, the first of the two pandemics involving the H1N1 influenza virus. It infected 500 million people around the world, and resulted in the deaths of 50 to 100 million (three to five percent of the world’s population), making it one of the deadliest natural disasters in human history. In Germany, worn down by war and lack of good food and clean water, the probability of dying was higher. Mom’s father was a machinist by training, but he served as a communications officer in the German Army in World War I. Her father was in the Army when Mom was born. Mom saw him for the first time after the war ended. She was five years old. Germany was in terrible shape at the end of the war. Workers had embarked on a prolonged general strike, a protest against the French occupation. The government increased print runs of banknotes, hoping to stimulate the economy and pay striking industrial workers. It was intended as a temporary measure rather than a long-term policy. As the French occupation and the general strike continued into the summer and autumn of 1923, the government could find no alternative way to address the crisis. As Berlin continued to pump paper currency into the economy, money became virtually worthless. A loaf of bread, which cost 250 marks in January 1923 had risen to 200,000 million marks in November 1923. On September 23, 1923, Mom, nine years old, and her 28-year-old mother sailed from Bremen, Germany on the SS York, bound for Boston. They had left her mother’s brother, Karl Voll, her family and friends, and the life they knew in Schweinfurt, in Bavaria, Germany to settle in the United States. Behind them was the aftermath of the Great War, the influenza pandemic, hyperinflation, a shortage of food… and ahead was America, the land of plenty, the land of opportunity. Neither Mom nor her mother spoke English. Neither Mom nor her Mother would ever go back to Germany. Her father had come to the United States a year earlier to join his brother, Ludwig Buehner, in building the Terminal Tower in Cleveland—one of the tallest buildings in the United States at that time. Thousands of other Germans had fled the country of their birth to settle in the United States, and there was a large German population on the east side of Cleveland. As Mom and her mother walked down the gangplank, dragging with them everything they owned, they couldn’t help but feel that the pain of the war and the suffering that followed would be behind them. But Mom said there was still one big worry that could end their American Dream—the health inspectors waiting on the dock below. Without her mother’s permission, her father had gotten Mom’s ears pierced before he left. One of Mom’s ears was badly infected. It never really healed. Mom’s mother told her child to smile and cover her ears with her hair. What if the immigration doctors would put them in quarantine or maybe even send them back to Germany? Their fears were unfounded. Soon they were on a train headed for a new life in Cleveland. The Buehners were Catholics. Albin played the violin, guitar, and trumpet and sang in the church choir. His brother, Ludwig, directed the choir and played the church organ. Mom remembers that they attended a predominantly German church, with an Irish church and other Catholic churches nearby. When Mom and her family settled in, Mom started the third grade for the second time. The nuns had her repeat the grade to help her to learn some English. Betty’s mother died in 1928. Mom was only 14 years old. Mom believes that with better care, her mother wouldn’t have died. Her father couldn’t take care of her by himself, so Mom was sent to be a nanny, and she moved to the west side of Cleveland to attend Lakewood High School. Essentially Mom was on her own from when she was a young teenager. What she made of herself was entirely up to her. Mom was working as a film editor at Tri-Star Pictures in Cleveland when she met Dad. Shortly after meeting him, Mom took a film editing job in New York. Through her work, Mom gained experience in working with a new medium—16-mm film. She convinced Dad that the new film size would revolutionize the sponsored film/industrial film industry. As such things go, they fell in love and were married by a Justice of the Peace in Niagara Falls. When they returned to Cleveland, Dad quit Tri-Star Pictures and Mom and Dad started Cinecraft Productions. Cinecraft was one of the first industrial film producers to use 16-mm film for commercials and one of the first to put sound on 16-mm color film. Used extensively in WWII, there was a huge expansion of 16-mm professional filmmaking in the post-war years. Films for government, business, and medical and industrial clients created a large network of 16-mm professional filmmakers and related service industries in the 1950s and 1960s. The advent of television production also enhanced the use of 16-mm film, initially for its advantage of cost and portability over 35-mm. At first used as a news-gathering format, the 16-mm format was also used to create television programming shot outside the confines of the more rigid television studio production sets. His technique involves the use of three cameras—one master camera which is fixed, and two others which are mobile and used for close-ups and oblique shots—all of which “grind” for the full 30 minutes. There are no retakes, no changing of lights or scenery. Later the best of the close-ups and oblique shots are spliced into the master film. The multi-camera technique cut production costs tremendously. Mom’s ideas on how to make industrial films quickly and cheaply allowed Cinecraft to win major clients, from Westinghouse and GE to U.S. Steel and the major tire companies. Mom and Dad did work for Ronald Reagan and Richard Nixon. And over the years Cinecraft hosted some Hollywood stars, including Alan Alda, Joe E. Brown, Tim Conway, Wally Cox, Brian Donlevy, Merv Griffin, Reed Hadley, Chet Huntley, Otto Kruger, Danny Kaye, George Montgomery, Burgess Meredith, Basil Rathbone, James Whitmore, and Harry von Zell. A few weeks after Mom’s 102nd birthday, John called to say that Mom had passed away in her sleep. I thought of her at rest with her stuffed animals surrounding her, the soft blue blanket keeping her warm, the yellow tinge of the night light illuminating her room.